"'Outrageously Good?' I'm not kidding. So simple to make, but the combination of ingredients makes it sophisticated. 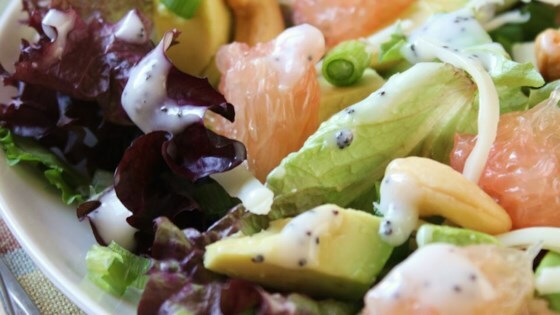 The mix of tangy grapefruit, sweet poppy seed dressing, buttery smooth avocados and Swiss cheese is incredible." Drain off excess juice from grapefruit sections; gently mix the grapefruit sections with the salad greens, green onions, avocados, and Swiss cheese. Toss with dressing just before serving. You could simplify preparation even more by using jarred grapefruit, but I prefer using fresh when it's in season. Would like to see a homemade dressing. I'm not a fan of bottled dressings. The grapefruit skins give it a bitter taste in each bite. This hasn't worked out for us at all. The key to the success of this is to remove all of the white membrane from the grapefruit before using it because it does have a bitter taste. I made everything as directed and everyone at the table loved it!